This good-looking Down East design features light, high-tech construction and pod drives, dramatically increasing fuel economy. 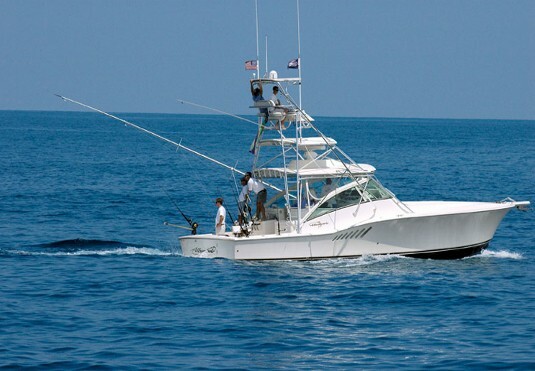 Sabre Yachts started out building sailboats in Maine in the 1970s and added fast trawlers to their line in 1989. Today, they still build in Maine and still build offshore sailboats, as well as modified-V, planing-hull luxury powerboats like the Sabre 40 I recently tested in San Diego. 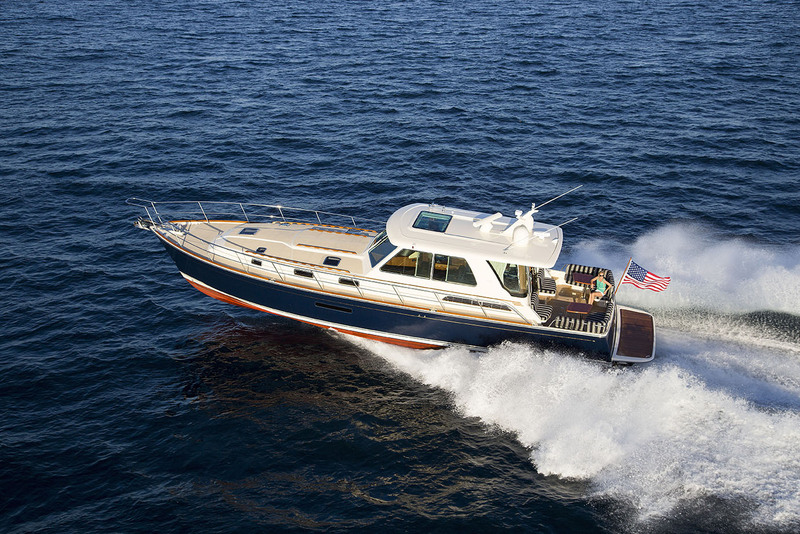 Powered by twin 425-hp Cummins engines and pod drives, the Sabre 40 Flybridge is an adaptation of the 2008 Sedan. The Sabre 40 is a mix of traditional Down East styling and high-tech construction, including dry-stack resin infusion and bi-axial stringers bonded to a foam core to reduce weight. Resin infusion is a greener process than old-fashioned manual layup, using less resin to make the boat lighter and more fuel efficient. The result is a faster and stronger boat that runs well with smaller engines. Our test boat was hull No. 2 of the Sabre 40 Flybridge, which is a modified version of the Sabre 40 Sedan that was introduced in 2008. Powered by twin 425-hp Cummins engines coupled to CMD Zeus 3500 pod drives that are controlled with a joystick, the boat is exceptionally maneuverable. Looking aft from the forward stateroom, the midships cabin can serve as either sleeping quarters or workspace. Three steps lead up to the mid-level galley. Boarding is easy from an ample swim step. A transom door leads into a spacious cockpit with an L-shaped settee, as well as a folding table that can be completely removed and stored in the compartment below the seat. Steps lead up from the cockpit to the flybridge, which has two Stidd chairs and a corner cockpit sitting area with a small table. Our boat was equipped with two Garmin 7212 touch-screen multi-function displays, Cummins’ Vesselview to keep tab on all mechanical functions, and a joystick control to the right of the gearshifts. The view from up here makes docking a breeze. As we headed out onto San Diego Bay I took a quick U-turn at 26 knots. The boat responded immediately and so smoothly that I never even leaned in the chair. Now this was fun. A sliding glass door leads from the cockpit to the saloon, which has an L-shaped settee that will seat six and a folding, high-low pedestal table to port. The 6’6” headroom and 14-foot beam add to the airiness of this space, which is finished in varnished cherry and sound-deadening soft headliner panels. Forward to port and two steps down is a mid-level galley, located to remove kitchen clutter from the social space but still leave the cook connected to the conversation. There’s an electric two-burner stove, a microwave convection oven, two-drawer refrigeration, a built-in coffeemaker, and significant storage beneath the teak and holly sole. To starboard is the helm station, with two chairs; the inboard one can turn to face the saloon. 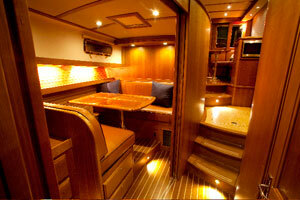 Just aft of the helm is a cabinet that houses the electrical panel and a 19” pop-up flat-screen TV and DVD player. This cabinet is large and leaves little room for much else other than a barrel chair aft, which seems like a design afterthought in an otherwise well-laid-out interior. The accommodations are optimized for a cruising couple with occasional guests, not for a growing family. Two steps down from the galley is the guest stateroom, which can be outfitted with an optional dinette that converts to a bed or functions as a lounge or office. A sliding shoji screen pocket door provides privacy for the occasional visitor. Across to port is a large head with a separate circular shower stall. The master stateroom forward has its own entry to the head, a queen-sized island berth, a flat-panel TV, and a surprising amount of drawer and locker storage for a hull with a fine entry. Dovetailed drawers, windows and hatches with Ocean Air screens and blinds, and excellent use of LED lighting highlight Sabre’s attention to craftsmanship and detail. Engines, batteries, and the Onan 9kW genset that comes standard are accessed via the power-lift floorboards below the saloon sole, so maintenance is easy. There are three starting batteries and two deep-cycle house batteries, with plenty of room to add more power or even an optional washer/dryer combo. The view from the flybridge makes docking a breeze. With the Zeus pod drives in “Docking Mode” where the RPMs are automatically lowered, a light, fingertip touch on the joystick got us out of a tight slip without a hiccup. Once out on the bay, we stopped momentarily to experience the Skyhook GPS-based dynamic positioning system, which comes standard. Between the pods and the engines, the boat stayed perfectly still once Skyhook was enabled, despite 10 knots of wind on the beam and a mild current. The Sabre 40 does not have bow or stern thrusters, which reduces the overall cost of the Zeus investment, and the system takes the anxiety out of holding station in just about any conditions. The vectored thrust of pod drives is very efficient, so higher speeds can be reached with less horsepower and therefore less fuel. In the event of a hard grounding, the aft-facing propellers are designed to shear off with minimal damage to the hull. The engines run cleaner and emit less noise so although they’re housed below the saloon, there’s very little noise in the cabin. The underwater exhaust helps with that, as well. In fact, test data shows noise at the inside helm no higher than 79 decibels, and that’s running at the top speed of 30 knots at 3,000 rpm. 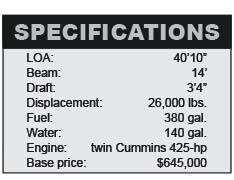 At the sweet spot of 25 knots and 2500 rpm (76 decibels), the Sabre 40 will travel 0.9 nautical miles per gallon, which gives it a range of 325 miles. 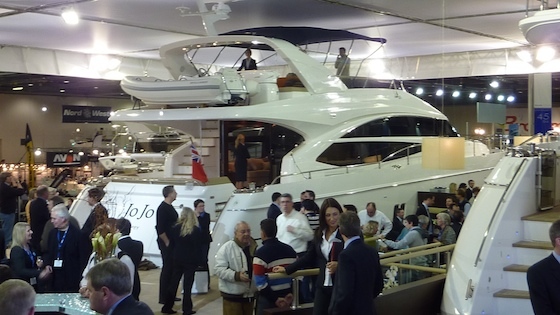 At 6.5 knots (800 rpm and 64 decibels) the range increases to over 900 nautical miles. What’s really impressive about the Sabre 40 is the easy handling. Driving from 15 feet up on the flybridge, the boat is tight and responsive. The wake is flat and the hole shot is amazing as all 26,000 pounds come up on a plane in a snap. The base price of the Sabre 40 Flybridge is $645,000, almost $60,000 more than the sedan model. But you get extra room, dual helm controls, and excellent visibility. The Sabre 40 is a well-built, rugged but posh coastal cruiser -- perfect for couples in the Pacific Northwest or Mexico, or point-to-point cruising between East Coast marinas. The Zeus drives and the joystick take the anxiety out of close-quarters maneuvering, and the boat will turn heads even in the slip. Once out of the slip—boy, is it fun. 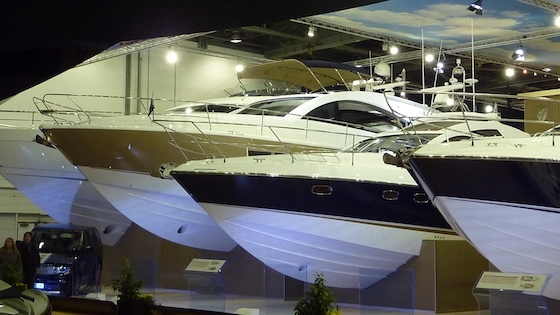 With the extra height of the flybridge, tight East Coast waterways with low fixed bridges might be a challenge. Also, the joystick control comes mounted to the left of the wheel, which may be counterintuitive for right-handed skippers. But on our test boat the joystick (at the request of the dealer) was on the right, so it’s an easy fix. 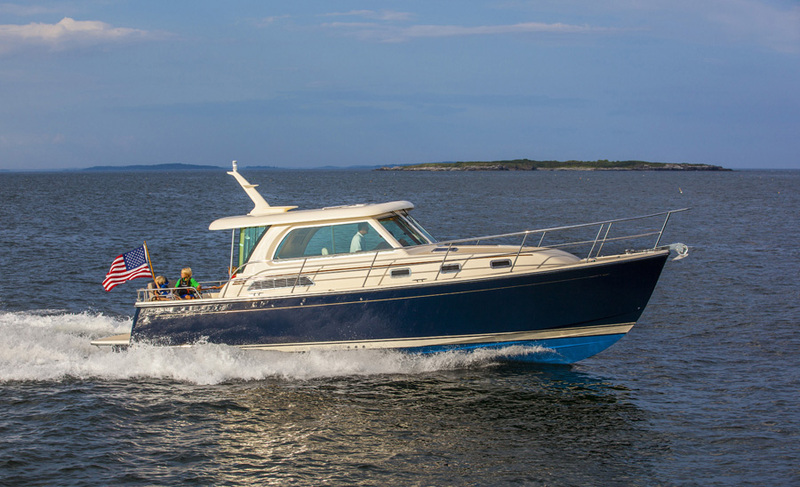 The Sabre 40 is purpose-built as a weekender for a couple with occasional guests, not a do-it-all boat for a growing family. If you want to go fast while saving money on fuel, and have fun while looking great, this is the boat to do it in. 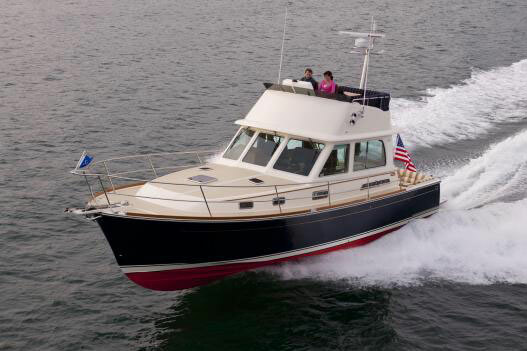 Another East Coast builder that made a name in sailboats but offers classic powerboats is Hinckley. Their Talaria 44 Flybridge may be something to consider as a comparable boat to the Sabre 40, especially in styling – but for considerably more money. 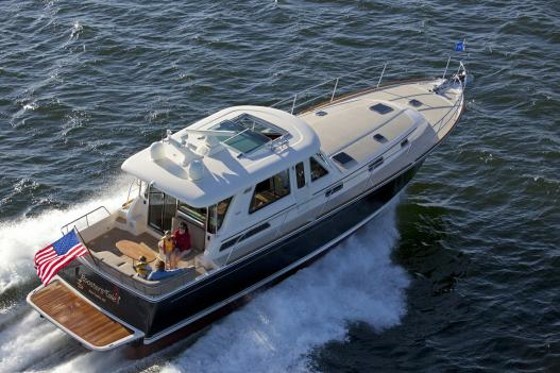 Another would be the Grand Banks East Bay Hardtop Express 43, also available in sedan and flybridge versions. 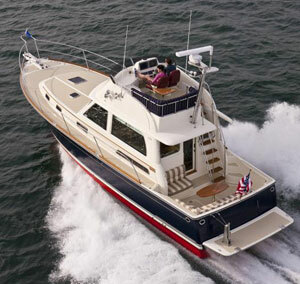 For more information on the Sabre 40 Sedan or Flybridge, visit Sabre Yachts.